Japan coach Eddie Jones named a 31-man squad for the Asian Rugby Championship on Thursday, saying the door was all but closed for anyone outside this squad and 11 players currently unavailable to make the cut for this year’s Rugby World Cup. 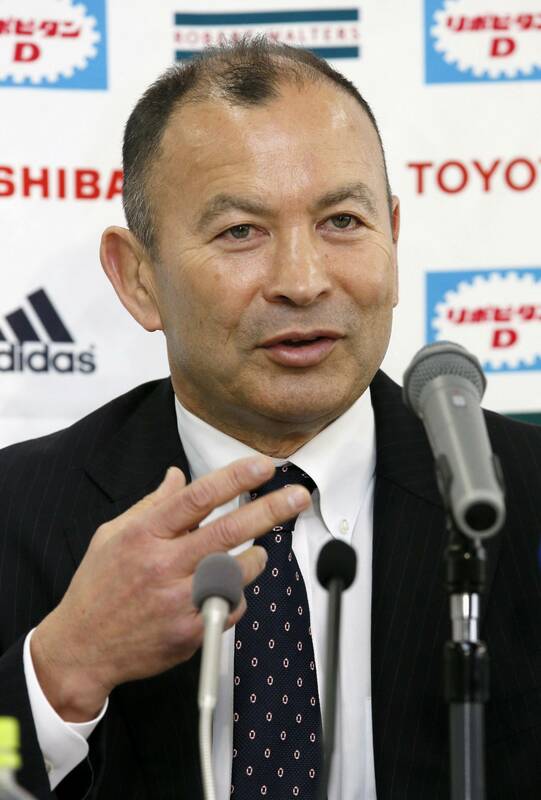 “No one outside the (original squad of) 41 has played well enough to warrant selection, and as they have no more rugby games to play to show their ability they will be relying on injury to get into the squad,” he said at Japan Rugby Football Union headquarters. One player not named in the original 41, however, does remain in contention. Amanaki Lelei Mafi dislocated a hip in December, but the big No. 8 recently attended a Brave Blossoms medical camp. “He is moving in the right direction and hopefully he will be fit,” Jones said. Of the other 10 currently unavailable, three are injured while “we now have six trying to play Super Rugby, which is a positive thing in itself,” said Jones. Meanwhile, Tim Bennetts must wait until June when he fulfills his three-year residency to be eligible to play for Japan. “There are certain parts of his game that he needs to change and the only way he can change them is if he can train with us,” Jones said of the Filipino-Australian. The 31 named to take on Hong Kong and South Korea on a home-and-away basis starting April 18 contain three uncapped players: Kazuhiko Usami, Ryu Sioapelatu Holani and Tsuyoshi Murata. “Selection was made on historical form, current form and potential form,” Jones said, explaining why Craig Wing and Justin Ives were picked despite missing large parts of last season and why a number of journalists’ favorites were not included. With Michael Leitch one of the six players to miss the ARC because of his Super Rugby commitments, a new captain will be unveiled in April at the team’s training camp in Miyazaki, though Jones stressed Leitch would lead the team at the World Cup. However, he added he was “very optimistic the players will make the changes. 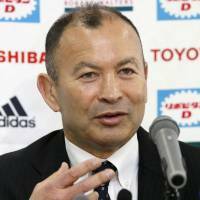 No one is guaranteed a spot but we have some really good players and I am confident we have the players to physically front up and be tactically smart when we come up against South Africa,” in Japan’s first game at RWC 2015 on Sept. 19. The Asian Rugby Championship is a new competition that takes over from the Asian Five Nations, a tournament that Japan won on seven occasions, winning all 28 games with a bonus point. The Brave Blossoms open their ARC campaign against South Korea in Incheon on April 18. They then play Hong Kong in Tokyo on May 2 and South Korea in Fukuoka a week later before closing out their campaign in Hong Kong on May 23. Forwards — Justin Ives (Canon), Ryuhei Arita (Coca-Cola), Shoji Ito (Kobe Kobelco), Kazuhiko Usami (Canon), Hitoshi Ono (Toshiba), Shinnosuke Kakinaga (Suntory), Takeshi Kizu (Kobe Kobelco), Luke Thompson (Kintetsu), Yusuke Nagae (Toyota Industries), Kensuke Hatakeyama (Suntory), Hisateru Hirashima (Kobe Kobelco), Michael Broadhurst (Ricoh), Hayden Hopgood (Kamaishi), R.K. Holani (Panasonic), R.S. Holani (Panasonic), Masataka Mikami (Toshiba), Tsuyoshi Murata (NEC), Hiroshi Yamashita (Kobe Kobelco), Hiroki Yuhara (Toshiba). Backs — Craig Wing (Kobe Kobelco), Keisuke Uchida (Panasonic), Ayumu Goromaru (Yamaha), Male Sa’u (Yamaha), Harumichi Tatekawa (Kubota), Yu Tamura (NEC), Toshiaki Hirose (Toshiba), Atsushi Hiwasa (Suntory), Kenki Fukuoka (Univ. of Tsukuba), Yoshikazu Fujita (Waseda Univ. ), Karne Hesketh (Munakata Sanix), Yuki Yatomi (Yamaha).